UFC 232 is just two days away from taking center stage at The Forum, in Inglewood, Los Angeles, California, and the fans seem to be expecting fireworks from the highly-anticipated event. The UFC has released the full episode of the UFC 232 Countdown, and details in regards to the press conference are now out! Following a recent drug screening of former UFC light heavyweight champion, Jon Jones, the UFC made a decision, earlier this week, to shift the venue for the UFC 232 event from Las Vegas to Los Angeles, California. The UFC seems to be wanting to end the year on a big note, with a stacked fight card ready to dance under the bright Octagon lights on December 29th, this year. The main event and co-main events of the fight card represent arguably the best male and female fighters in the UFC's current roster. A rematch between Alexander Gustafsson and Jon Jones will feature as the main event, alongside the women's championship title fight between Cris Cyborg and Amanda Nunes for the co-main event. Following the recent case in the Jon Jones matter, the Nevada State Athletic Commission subsequently denied the ex-champion of a license to fight within the Las Vegas area, forcing the UFC to move the event to The Forum, in Inglewood, California. The press conference for UFC 232 event is set to unfold at the Los Angeles Marriot Marquis Ballroom, and will be free and open for public viewership from 2 pm onward on Thursday, the 27th of December. The UFC has also released the UFC 232 Countdown video, that displays the demeanour of the fighters and their respective camps, leading up to UFC 232. Click on the video below and be sure not to miss out on the action! UFC 232 is expected to exceed the expectations of fight fans across the globe, thanks to the stacked fight card scheduled to unfold at The Forum. Although the UFC may not make the projected pay-per-view numbers at The Forum, in comparison to the T-Mobile Arena in Las Vegas, millions of spectators around the world will be on the edge of their seats at home. 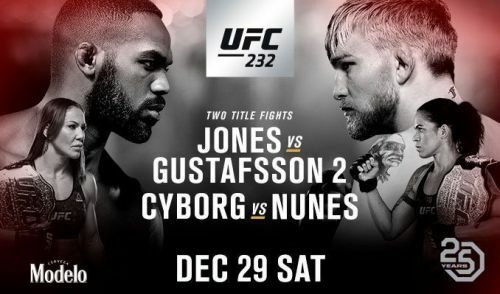 Any early predictions for the co-main and main event fights on the UFC 232 card? Be sure to leave them in the comments section below!